Experience the brightest autodarkening lens with vegaview2.5! 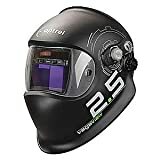 Optrel redefines visibility for welders with a 4 times brighter view in light state and in grind mode. Just taking a look at this helmet one of the first things I notice about it is like I just mentioned this helmet is incredibly lightweight, you can barely even tell you're holding it and you know what I've been looking at this and I can tell you guys it's probably at least a good couple ounces lighter than the Jackson Safety BH3 Auto Darkening Welding Helmet with Balder Technology which by the way has been phenomenal. I've had mine for a couple years and it's a Slovenian made and it's definitely one of the best helmets I've ever used it highly recommend it but this one is a good couple ounces lighter at least in my opinion and one of the other things I noticed about it is that it's got this really nice curved shape to it and I did a little bit of researching it turns out that Optrel actually designs these helmets for overhead welding. this one is literally made for it you can see just by looking at this it'll basically just half about anything you can throw at it just roll off and off to the side one of the other things that speaks to the phenomenal design of this helmet is if you see here if we put this thing face down it never actually comes in contact with our table and this is really good because you don't have to worry as much about destroying these clear lenses and this is something it's nice to see especially on a helmet like this so this way you know if your helmet ever gets knocked off a table or you drop it or you set it down a little bit on the careless side. You don't have to worry nearly as much about your front lens because it won't actually come into contact with a flat surface like this, this helmet appears to be made out of some type of polymer composite and it is extremely lightweight like we just talked about and it also feels incredibly sturdy it's nice and flexible. I like is the decorations on the side of this helmet here I'm normally not one for ridiculous over-the-top decorations on a hood the terms of graphics and whatnot but this is what I think of it's very tastefully done you got a little bit more detail than you would with a standard flat black helmet but it's not over the top making you the outer shell and the clear lens. Before we do some welding with this I just want to see how difficult it is to replace this clear lens because with some helmets is a little bit on the complicated side now. I have never before taken this off and I have not read the manual I have no idea what to do here but I'm just seeing these two buttons and I'm assuming if I press them in then then this should come off like I said, just push in these buttons and then the clear lens comes right off this is an incredibly intuitive design. If you push down on the clear lens so that goes down and the button goes up so I mean you have to do that which really isn't hard especially once you know what to do but you know I thought was just a push on this like if I'm bumping into the side of something you know that's not coming off now almost all the controls for this helmet are external which some people like some people don't the concern with that is that you know you can accidentally bump into your your selector here and end up welding in a shade that's too bright or too dark for what you're doing. I mean you if this was a piece of metal you'd really have to like dig into that or something but yeah I don't see that being too much for problem. Another thing that I'm seeing about this helmet that I really like is its shades eight through twelve which is pretty standard but it's an infinite adjustment there's not like one shade increments if you're doing something really precise and you want to be at shade you know nine and a half and it's a little bright you can just nudge it up a little bit just to get things perfect and that's really good. You know it's a small feature but it's the kind of thing that can really enhance your your comfort and to some extent the safety of your eyes as well now, right next to our shade adjustment knob we have the other sensitivity control in this as you know just regulates how much light it takes to trip this helmet from its light state into its dark state and this is very clearly marked and as you can see it's still really easy to grab but this would be very difficult to accidentally turn and it looks like you get quite a wide variety of adjustment. Here another thing which I absolutely love from a Productivity standpoint is the control for the grind mode is here on the side so you don't have to take the helmet off and flip it into its grind mode manually, you just press this and you kind of have to make a deliberate motion there, I mean that goes a pretty considerable way down into our button so again probably not something you're going to do accidentally and then once you engage grind mode on this helmet. This little red LED on the inside of the helmet starts flashing and I wouldn't consider that enough to be annoying but it definitely reminds you that you're in grind mode so you know if you set your helmet down for something, then you put it back on you go to start welding something. you'll definitely see that up there and hopefully you won't flash yourself and of course to get it out of grind mode we just press this out of focus button again and it stops very clear. I'm going to hit it again, very definitive controls and that is as intuitive as it gets you don't even have to take your glove off that's pretty sweet, something else you'll notice on the inside of the helmet is our delay control which again as you probably already know if you're watching this video just sets how long it takes for this helmet to go from its light mode I'm sorry from its dark mode when you're welding back into its light mode so if you're really welding the way on something you're dumping a lot of heat into it and it's it's glowing to the point where it's really bright then you know you can set this a little bit longer and it won't be glowing to spray it when the helmet goes back to its light state you see it I know it sounds crazy but that really can give you some eye fatigue been there done that not fun something else that's incredibly impressive about this helmet is that it sets the world record for the brightest view in its light state. It means there's a lot more you can do without a face shield you know just by hop in this convenient little control into grind mode and using your helmet when you're running an angle grinder or some type of saw or whatever and that means you save time because now you're going to be taking this off and going and finding your face shield and putting it on less. It also means an increase in safety because before if you're like now it's correct I don't need a face shield for this I'm just running an angle grinder for 30 seconds you know what can go wrong been there done that had metal removed out of my eye but with this because it's clear and it's a lot easier to see through personally I think you'd be a lot more inclined to just hit this again extremely convenient button and put it back in 12 mode and then do your smaller chop of this. It's not the helmet it's the fact that we're filming something digital and trying to do that with a camera but I will say in first person this is phenomenally clear and another thing that I like about it I'm trying to get this light here to sort of halfway simulate a welding art for you guys, something else that I really really like about this lens is the color as you can see here it's kind of like an orangish yellow and this is something that that's pretty much personal preference myself. Something else that really stands out in my mind about using this helmet is the fact that the color and the differences in color between things is phenomenal you know you're TIG welding steel for instance the tungsten is going to be one color of course and you got the arc which is a completely different color then the puddle is going to be a different color then you'll see the color of the base metal in the individual grind marks and when you've prepared it and the definition of this helmet and the difference in color is phenomenal I think in terms of difference of color this is definitely the best helmet I've ever used in terms of resolution. The one big con I've had with this helmet you can see how this lens has a lip around it well if you're an overhead position this lip really likes to catch spatter and as you can see that big hole right there goes all the way through now. I've emailed Optrel and it's been about two weeks and still no reply so we'll see how their customer service goes but if you guys are looking for a really good helmet this would be a great pick the only suggested suggestion I maybe put some aluminum tape here or paint your shell so that it would kick off spatter a whole lot easier but otherwise this is a really great hood.